I'm sure we've all had those moments. A cluttered mind in a yoga practice, our bodies stiffer and more rigid than usual, or perhaps a recent injury limiting our movements. Sometimes it can simply begin within the first breaths of frustration, and spiral downward from there. The yoga slump: a period in which the body and mind connection is lost on the mat. Really, how do we get over the hump of a yoga slump? Have you ever heard the saying, "A lesson will keep repeating itself until it is learned"? A similarity may be that we must pause and acknowledge a slump in our yoga practice in order for it to come to end. Too often we tend to over-analyze and wonder "Why is this happening," or "How can I fix this", when we should just quietly exist in these moments of idle. It may sound counterproductive, but usually, less focus on the physical body (and more focus on the mind) can bring us back to a stronger body. Herbal teas are my favorite, and many of them can calm the mind and create a sense of healing in the body. Sometimes a yoga slump can create or elevate a negative mood, allowing the body to become tense, and being tense will only further the slump. A nice, steaming cup of herbal tea can "bring us back down to earth," so to speak. Feeling more grounded will help us become more grounded in our practice. Being grounded means accepting what is and what has been. For a vibrant earthy tea, try nettle or chamomile! Don't be too hard on yourself, especially if your muscles are weaker than normal, or if you've had an injury. Plan out some time for a little TLC. Get a massage, soak extra-long in a hot bath, maybe get in a little more sleep! This concept of loving yourself goes back to "pressing pause," which is so important in order to gain the momentum to move forward. Doing these three things will help ease you back into a strong, confident, and healthy yoga practice. There's nothing wrong with a yoga slump; don't be afraid of it and don't let it consume you. Pause, drink some tea, and do something that feels good! by Julie Gondzar - Julie has been practicing yoga for just over a year, and lives in the beautiful state of Wyoming. 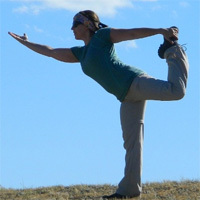 She’s a part-time freelance writer with interests in health, wellness and the yoga lifestyle.